N9YC replaces N9Y. First Prefix ~ Thread Size & Reach (A to Z) ~N9Y. Spark Plugs. know your spark plugs - original symbols. Set of SIX. NOT included. C = New Copper Plus range. TVR 2500M ; YEARS 1972-1977. These plugs are manufactured by Champion and are suppliedNEW. They have the Part No.N9YC and they have the enhanced copper core. NGK Spark Plugs BPR5E 7075 x8 Fits TVR 350i 3.5l. TVR GRIFFITH 4.3 Spark Plugs Set 4x 90 to 93 NGK. TVR 400 3.9 Convertible Petrol 01/1989 12/1993 RWD 16 272 200. TVR 450 4.4 Convertible Petrol 01/1989 12/1993 RWD 16 323 238. TVR CHIMAERA 4.0 Convertible Petrol 01/1993 10/2003 RWD 16 241 177. TVR Chimaera 4.0 V8 Rover NGK Bujías X 8 estándar B7ECS ! nuevo! Manufacturer Part Number: B7ECS. Model: CHIMAERA. Short Code: 2528. NGK SPARK PLUGS FOR CARS > NGK STANDARD SPARK PLUGS. Engine Type: V8 ROVER. Product Type: SPARK PLUG. 100% SECURE. Product Version: STANDARD. TVR 400 3.9 Spark Plugs Set 4x 89 to 93 NGK. TVR 400 3.9 Convertible Petrol 01/1989 12/1993 RWD 16 272 200. TVR 450 4.4 Convertible Petrol 01/1989 12/1993 RWD 16 323 238. TVR CHIMAERA 4.0 Convertible Petrol 01/1993 10/2003 RWD 16 241 177. TVR CHIMAERA 4.3 Spark Plugs Set 4x 1993 NGK. TVR CHIMAERA 4.0 Convertible Petrol 01/1993 10/2003 RWD 16 241 177. TVR CHIMAERA 4.3 Convertible Petrol 01/1993 12/1993 RWD 16 280 206. TVR CHIMAERA 5.0 Convertible Petrol 01/1993 10/2003 RWD 16 340 250. TVR SPEED EIGHT 3.9 Spark Plugs Set 4x 89 to 92 37A40P NGK. TVR 400 3.9 Convertible Petrol 01/1989 12/1993 RWD 16 272 200. TVR 450 4.4 Convertible Petrol 01/1989 12/1993 RWD 16 323 238. TVR CHIMAERA 4.0 Convertible Petrol 01/1993 10/2003 RWD 16 241 177. TVR GRIFFITH 5.0 Spark Plugs Set 4x 95 to 02 V8Rover NGK. TVR 400 3.9 Convertible Petrol 01/1989 12/1993 RWD 16 272 200. TVR 450 4.4 Convertible Petrol 01/1989 12/1993 RWD 16 323 238. TVR CHIMAERA 4.0 Convertible Petrol 01/1993 10/2003 RWD 16 241 177. TVR Tuscan 3.5 V8 NGK Bujías X 8 estándar BPR5E  Nuevo en Caja! Manufacturer Part Number: BPR5E. Model: TUSCAN. NGK SPARK PLUGS FOR CARS > NGK STANDARD SPARK PLUGS. Short Code: 7075. Product Type: SPARK PLUG. Engine Type: V8. Ground Electrode Material: NICKEL. Centre Electrode Material: NICKEL. TVR GRIFFITH 4.0 Spark Plugs Set 4x 90 to 93 37A40P NGK. TVR 400 3.9 Convertible Petrol 01/1989 12/1993 RWD 16 272 200. TVR 450 4.4 Convertible Petrol 01/1989 12/1993 RWD 16 323 238. TVR CHIMAERA 4.0 Convertible Petrol 01/1993 10/2003 RWD 16 241 177. Model: TVR GRIFFITH. The ultimate spark plug with its iridium center electrode and an Iridium ground electrode. Ideal for long service intervals or an upgrade from standard copper platinum or Iridium spark plugs. Manufacturer Part Number: BKR5EKU. Model: CERBERA. Engine Type: AJP (TVR ENGINE). NGK SPARK PLUGS FOR CARS > NGK STANDARD SPARK PLUGS. Product Type: SPARK PLUG. Engine Size: 4.2. 100% SECURE. Product Version: STANDARD. TVR TAMORA 3.6 IL6 3.6L NGK Bujías estándar X 6 DCPR 8E  Nuevo en Caja! Engine Type: IL6 3.6L. Manufacturer Part Number: DCPR8E. Model: TAMORA. Short Code: 4179. NGK SPARK PLUGS FOR CARS > NGK STANDARD SPARK PLUGS. Product Type: SPARK PLUG. Ground Electrode Material: NICKEL. TVR S2 2.9 89-90 V6 Ford NGK Bujías estándar X 6 BCPR 6E  Nuevo en Caja! Manufacturer Part Number: BCPR6E. Short Code: 1269. NGK SPARK PLUGS FOR CARS > NGK STANDARD SPARK PLUGS. Product Type: SPARK PLUG. Engine Type: V6 FORD. Ground Electrode Material: NICKEL. Centre Electrode Material: NICKEL. Specifico per: TVR S3 MOTORE With Cat. Le candele d’accensione a marchio NGK sono sinonimo di qualità, affidabilità e durata nel tempo. L'INSERZIONE SI RIFERISCE ALL'ACQUISTIO DI SEI (6) CANDELE. Aggiungi ai Preferiti. Model: TVR GRIFFITH. Set of 8 PureSpark Iridium (Iridium centre Electrode) Spark Plugs. With its iridium center electrode this spark plug will match most other Iridium spark plugs available while still at an affordable price. Bosch Short Code: FR7KI332S. Model: Cerbera 4.2i V8. BOSCH SPARK PLUGS > PLATIN-IRIDIUM FUSION LPG-GAS. Plug Type: Platinum-Iridium Fusion CNG/LPG-Gas. Part Type: Spark Plug. Fitting Note 1: Product for gas operation only. Unipart Bujía GSP4652 x4 Ford Fiat Datsun Honda Saab TVR Morgan, Volvo, etc. Unipart GSP4652 fits DATSUN 300ZX 3.0 5/84-5/84. TVR S Series 2.9 V6 less cat 10/87-1/93. FIAT Uno 1.3 turbo 7/85-1/90. MORGAN 4/4. 1597cc Ford CVH eng 1/86-10/91. 1598cc Ford CVH 11/01-7/93. CARLTON 3.0 24v 10/89-on. N9YC replaces N9Y. First Prefix ~ Thread Size & Reach (A to Z) ~N9Y. Spark Plugs. know your spark plugs - original symbols. Set of SIX. Basic Number (1 to 99) ~ Heat Range ~N9 Y. N = Thread 14mm ~ Reach 3/4" (19.0mm). TVR 290i 2.9 NGK Bujías X 6 estándar BPR6E  Nuevo en Caja! Manufacturer Part Number: BPR6E. Model: 290i. Short Code: 6464. NGK SPARK PLUGS FOR CARS > NGK STANDARD SPARK PLUGS. Product Type: SPARK PLUG. Ground Electrode Material: NICKEL. Centre Electrode Material: NICKEL. 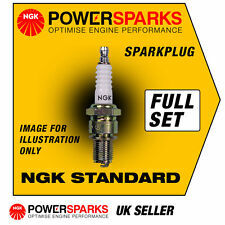 NGK Spark Plug APR6FS. 2922 TVR TASMIN 2.0 79 –> 84. 2922 CLIMAX 460 cu.in. 2922 FORD GRANADA 1.8 OHC 85 –> 89. 2922 FORD GRANADA 2.0 OHC 85 –> 89. Plug Type - Projected centre electrode insulator - resistor type. NGK IRIDIUM IX Bujías [x8] TVR 350i 3.5 todos los años [BPR5EIX 6597] Nuevo! Manufacturer Part Number: BPR5EIX. Model: 350i. Short Code: 6597. NGK SPARK PLUGS FOR CARS > NGK IRIDIUM IX SPARK PLUGS. Product Version: IRIDIUM IX. Centre Electrode Material: IRIDIUM. Product Type: SPARK PLUG. 5 de 5 estrellas - NGK IRIDIUM IX SPARK PLUGS [x8] TVR 350i 3.5 All Years [BPR5EIX 6597] NEW! 1 Valoración de producto1 valoraciones de producto - NGK IRIDIUM IX SPARK PLUGS [x8] TVR 350i 3.5 All Years [BPR5EIX 6597] NEW! TVR S3C 2.9 Gato NGK Bujías X 6 estándar BPR6EF  Nuevo en Caja! Manufacturer Part Number: BPR6EF. Model: S3C. Short Code: 4665. NGK SPARK PLUGS FOR CARS > NGK STANDARD SPARK PLUGS. Product Type: SPARK PLUG. Ground Electrode Material: NICKEL. Centre Electrode Material: NICKEL. 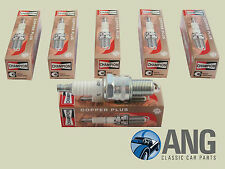 UNIPART GSP4154X Spark Plugs x 4. NGK Spark Plugs DCPR8E 4179 x6 Fits TVR TAMORA 3.6l. Bujía de encendido 1pc NGK B7ECS TVR. 450 de TVR < abarcan clase = notranslate ' > 4.4 238 01.1989 - 12.1993. TVR CHIMAERA < abarcan clase = notranslate ' > 4.0 177 01.1993 - 10.2003. TVR CHIMAERA < abarcan clase = notranslate ' > 4.3 206 01.1993 - 12.1993. 6x GSP4763 unipart spark plugs. Typically found in all 6 Cyl Jaguars till the early 1980s. Also found in Healey 3000 & TVR 2.8i Tasmin. Leacy Classics - Suppliers of Classic Parts for Classic Cars. Short Code: 94658. Model: S3C. NGK SPARK PLUGS FOR CARS > NGK IRIDIUM IX SPARK PLUGS. Product Version: IRIDIUM IX. Centre Electrode Material: IRIDIUM. Product Type: SPARK PLUG. Ground Electrode Material: NICKEL. NGK IRIDIUM IX Bujías [x6] TVR 290i 2.9 todos los años [BPR6EIX 6637] Nuevo! Model: 290i. Manufacturer Part Number: BPR6EIX. Short Code: 6637. NGK SPARK PLUGS FOR CARS > NGK IRIDIUM IX SPARK PLUGS. Product Version: IRIDIUM IX. Centre Electrode Material: IRIDIUM. Product Type: SPARK PLUG. BOSCH SHORT CODE: FR78. FITS MODEL: Cerbera. FITS MAKE: TVR. BOSCH SPARK PLUGS > SUPER-4. SPARK PLUG TYPE: BOSCH SUPER 4 SPARK PLUG. FITS ENGINE TYPE: i V8. Part Type: Spark Plug. Warranty Period: Manufacturer Warranty if applicable - See Bosch website for more details. Set of 8 NGK BP6ES Spark Plugs (long reach). These plugs are suitable for Rover V8 engines produced between 1976 and 1999. Set of eight NGK BP6ES. Suitable for Rover V8 engines 1976-1999. 19mm thread reach. Model: Cerbera 4.2i V8. Material: Yttrium Enhanced Copper Core. BOSCH SPARK PLUGS > SUPER PLUS. Bosch Short Code: 6. Plug Type: Super Plus. Part Type: Spark Plug. Warranty Period: Manufacturer Warranty if applicable - See Bosch website for more details. Specifico per: TVR Griffith 3.9. Le candele d’accensione a marchio NGK sono sinonimo di qualità, affidabilità e durata nel tempo. L'INSERZIONE SI RIFERISCE ALL'ACQUISTIO DI OTTO (8) CANDELE. Aggiungi ai Preferiti. Material: Yttrium Enhanced Copper Core. BOSCH SPARK PLUGS > SUPER PLUS. Bosch Short Code: 1. Model: 3.5 Injection. Plug Type: Super Plus. Part Type: Spark Plug. Warranty Period: Manufacturer Warranty if applicable - See Bosch website for more details.